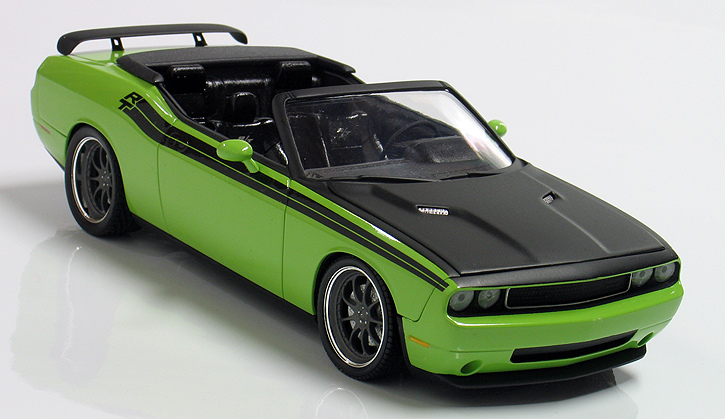 As soon as I saw that AMT was going to make a new model kit available of the 2009 Dodge Challenger R/T, I knew I had to build one. 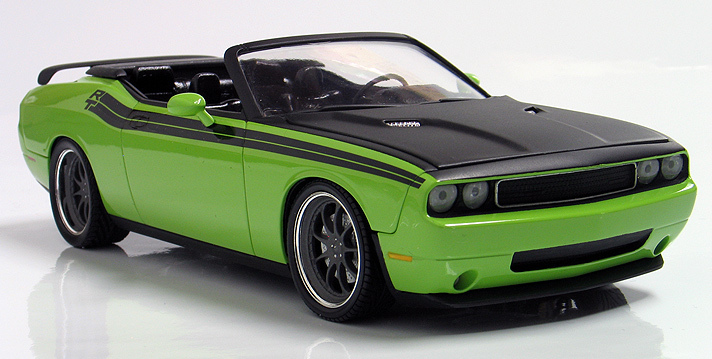 I think the new 2009 Hemi powered Dodge Challenger is a really hot looking car and I'd like to own a real one. Maybe some day, but in the meantime, I created this scale version. While the stock Challenger looks great I thought it would be more fun to build a custom pro-touring style edition of this car. And since I have an affection for wind in my hair I decided to make it a custom drop top. Body mods to my model were pretty simple. I cut the top off with a razor saw and scratch built a convertible boot from sheet styrene. The only other mod was to drill out the gas filler car and make a NASCAR style fuel filler in it's place. I also bondo'd over the recessed hood emblem for a smoother look. The kit's body features holes in the trunk lid for the factory rear spoiler. I smoothed over the holes before painting so I could use a custom made wing instead. For the paint scheme I wanted a classic factory Mopar muscle car look, but decided to put my own twist on it. 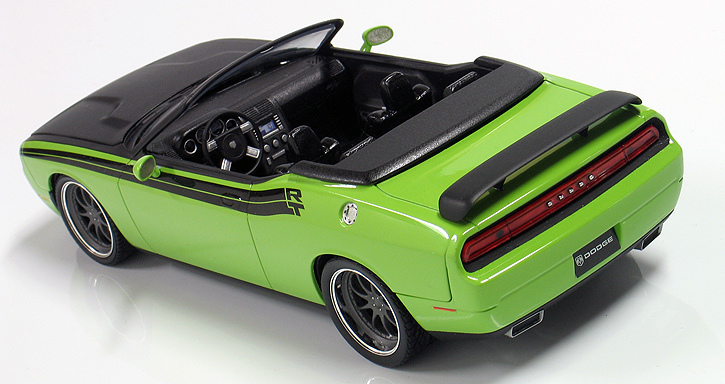 The paint is Testor's lacquer in sublime green which is not a factory color for the new Challenger, but should be. The '71 style R/T side stripes were taken from the decal sheet I designed for Model King Challenger funny car kit. The decals fit the new Challenger's body contours pretty well. I modified the decals slightly by trimming the angle of the leading ledge of the stripe to better match the angle of the front fenders. Afterward, the body was clear coated of PPG concept 2000 urethane. Lastly, the hood and windshield frame were masked and sprayed flat back. 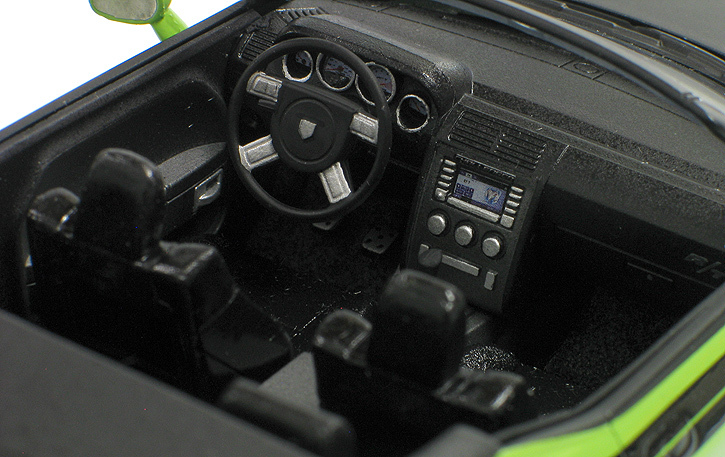 The interior is right from the box. The only addition being to add some dark gray flocking to make the carpeting look a little more realistic. The 22 inch rims are from Pegasus Hobbies. Since the wheels have removable centers, I ground out rear rims to allow the wheel centers to sit further into the rim for a staggered look. The centers were then painted with Testor's model master titanium. These wheels come with four of the same sized tires so I dug through my parts box and found a set of front tires with a shorter side wall and narrower width to complete the big and little look. The brakes are my own cast resin pieces. Lastly, I wanted to add an old style Mopar accessory wing to the trunk. I test fitted a few wings I had from several other kits, but nothing seemed to look proportionally right to my eye with the big wide Challenger body. So, I built one from scratch by cutting up and reshaping a piece of a discarded roof C pillar from an AMT '70 Buick I had laying around. It's not a replica of the old style wing, but more of my take on a modern interpretation.